For over 50 years through the leading of God, the Christian and Missionary Alliance churches of the Northwestern District have been building and developing a camp for the purpose of bringing people to a closer relationship with Jesus Christ. Its people have put into it countless hours of work and dedication, overcoming financial problems, spiritual testing, and feats of nature. In 1959, Rev. Leo Berreth, Leslie Pippert, and Viron Miller, after prayerful deliberation, stepped out in faith and purchased an old 120-acre camp for $18,000. Located on Big Sandy Lake, they named it Big Sandy Conference Grounds. The camp had formerly been a CCC camp from the 1930s. It was dotted with old shacks and about 90% wilderness. Rev. Leo Berreth, one of the first directors, soon earned the reputation of burning a cabin a week for bonfires. The first camp sessions were held in the summer of 1960 with three camps. The following year, a second purchase of land was made when the camp acquired nine more acres, including the entrance from the road and log house, now used as the maintenance home. This was purchased, with no back-up money, for $17,000. In years to follow, various buildings were erected, including the main lodge (now referred to as Lakeview Lodge). In 1968, remodeling was completed on the chapel. This building had been the summer cabin of former governor Floyd Olsen. The next year, the camp became a year-round operation when weekend retreats were made available. Family camps also became new avenues for ministry. 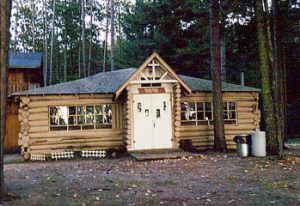 Today there is not much to remind you of the old CCC camp, but throughout the years the Lord has continued to bless the Big Sandy Camp ministry. Currently, 11 summer sessions are held, including non-Alliance camps, with nearly 2,500 people in attendance. Openings for fall and winter weekends fill rapidly as retreats are planned for youth, men, women, and church families. Young people and adults continue to meet the Lord through experiences at Big Sandy Camp. The number of our camp friends is growing and it’s the desire of the camp that the Lord will continue to use it as a means of reaching lives for Him and that He will be glorified in the days ahead. Big Sandy summarizes its mission with “Changing Hearts and Touching Lives.” We strive to keep each summer camp experience packed with excitement, built on the foundation of God’s word. Every year we offer improved programing, new experiences and rich, Big Sandy Camp traditions.